Revitalization efforts along the SW 9th Corridor are underway! On March 23, 2015, the SW 9th Street Corridor Plan was formally adopted by the Des Moines City Council. Created in partnership with the City’s Neighborhood Development Division, the ISU Community Design Lab, and Friends of SW 9th, the revitalization plan sets the stage for phased improvements to enhance the visual appearance of the four-mile corridor stretching from the Raccoon River bridge to Army Post Road. Redevelopment of vacant and run down property, housing improvements, and building organizational capacity are also key strategies of the plan. Significant progress is already visible, thanks to dedicated project partners. Spearheading the efforts is Friends of SW 9th, a coalition of area residents, businesses, and stakeholders working to coordinate improvements. 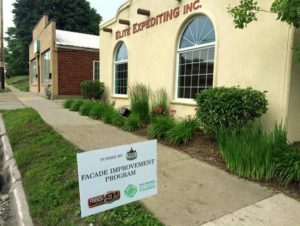 Friends of SW 9th recently administered a Façade Improvement Program in which fifteen local businesses received financial assistance to spruce up their storefronts with new paint, awnings, landscaping, and signage. The program was made possible with a $150,000 grant from Polk County. Proceeds from the sale of City-owned property on SW 9th will help fund continuation of the façade grant program in 2016. Demolition of several blighted structures is paving the way for additional commercial and residential redevelopment along SW 9th Street. The Neighborhood Development Corporation is nearing completion of two residential developments south of downtown. Rebuilding Together, Neighborhood Finance Corporation, and Iowa State Bank have also made three-year commitments to help rehabilitate existing owner-occupied housing. MacRae Park, one of the City’s oldest and most scenic parks, will be enhanced as well. Renovation of the historic park shelter will take place this summer. Planning efforts for more significant improvements are underway, aiming to re-establish the park as a south side destination. To keep this momentum moving forward, the Friends of SW 9th is reaching out to property owners along SW 9th to establish a Self-Supported Municipal Improvement (SSMID) District. If the SSMID petition is successful, funds will be used towards business development and recruitment, façade grants, landscaping and beautification efforts, administrative services, and neighborhood activities such as the popular SW 9th Open Streets event.